It doesn’t get much easier than this, folks! Dress ’em up, dress ’em down– these little guys are great for class parties, Christmas festivities, birthdays, and after school treats no matter what you do (or don’t do!) with them. Simplify the frosting by using store bought or fancy it up with fun colors and flavors. Even consider using chocolate melts instead of any frosting at all! 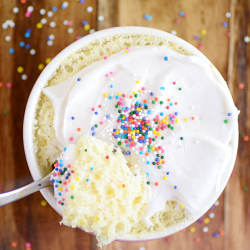 All you need is a cupcake tin, the makings for rice krispie treats, and something to go on top! 1. Scoop two 1/4 cups of the rice krispies treats mixture into each well greased or lined muffin tin. Pat the first scoop down firmly into the tin. Round the second scoop on top, using a well greased rubber spatula, to resemble the top of a cupcake. 2. Prepare the butter cream and fill frosting bags for piping. 3. Roll out a comfortable 2 feet of clear plastic wrap. 4. Dollup a “frosting-bag’s-worth” of frosting onto the center of the plastic wrap. 5. Gently wrap the plastic around the frosting like you would a present, forming a cylinder. 6. Tightly twist the plastic wrap from the ends to the center. When you’re done, just toss the wrap and enjoy your clean frosting bag! The frosting bad tip is genius! Thanks for sharing! Those are absolutely adorable. I hadn’t seen the plastic wrap trick. Great idea! I tried that frosting tip, too…best ever! Oh my goodness, how CUTE are these?!?!? These would be PERFECT for my son’s class party in a few weeks. I hadn’t seen the bag trick yet…thanks so much for sharing that!! Are you kidding me? …I’m pretty sure that’s all I ever say as a comment, because all your recipes blow me away! I love this.!. Thank you for the tip! I create the biggest disaster ever each time I try to frost something and then the sink is full of frosting bags and failed attempts at using Ziploc bags to frost for dayssss. This might just help me! These are adorable! 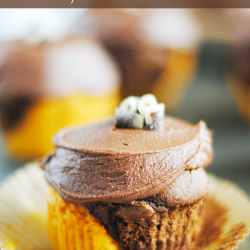 That frosting bag tip is smart…love it! BRILLIANT! These look delish too! These rice crispies looks so cute and delicious! I can definitely see this as a bakesale hit for fundraising at school. And the plastic wrap tip is genius! It’ll save me from having to clean the bag all the time. wow! !this is a great idea,I have already fed up with cleaning plastic bag…. those really are cute! And I keep seeing the frosting idea on line, but seriously that would take away from my “oops got icing on my hand, better lick that” Which I totally don’t do, you know. Much. You HAVE to share this at the linky party!! See you there!! You’ve been featured at my Hookin Up with HoH party! Feel free to grab a button if you’d like. I love this frosting technique. These are beautiful. I’ve highlighted them on Sweet Indulgences Sunday this week. What a cool idea! I am going to try it next time I am frosting something! Thanks for sharing! These Rice Krispie cupcakes will be a BIG hit at my house!!! I can’t wait to make them!!! !